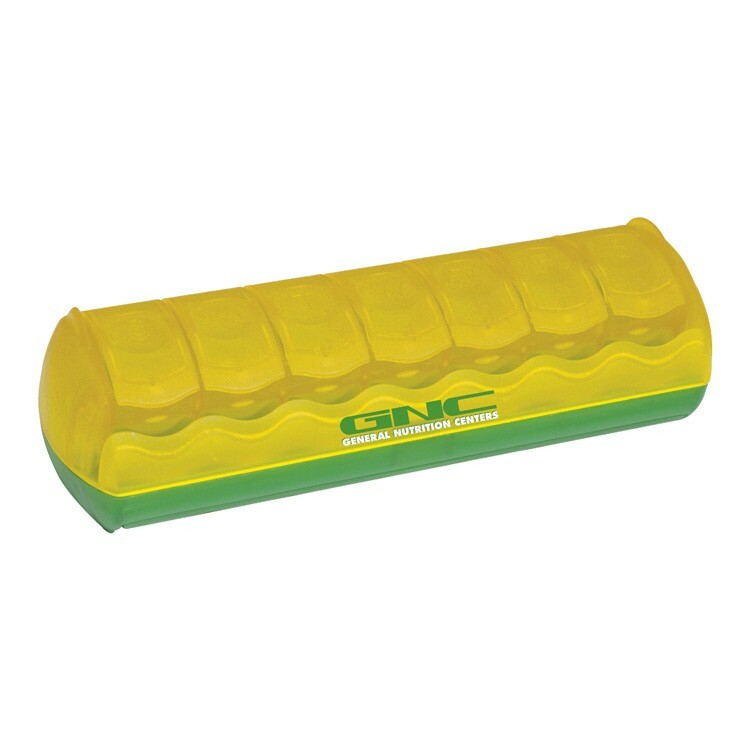 Imprinted With Your Logo, Motto, Mascot, Slogan or Advertising Message! 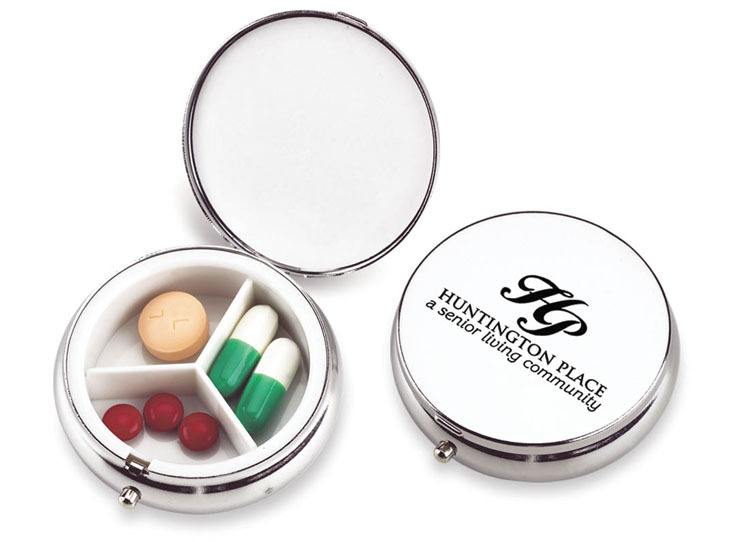 Pill boxes, pill trays, pill holders and cutters are popular logo imprinted healthy promotional handout gifts! 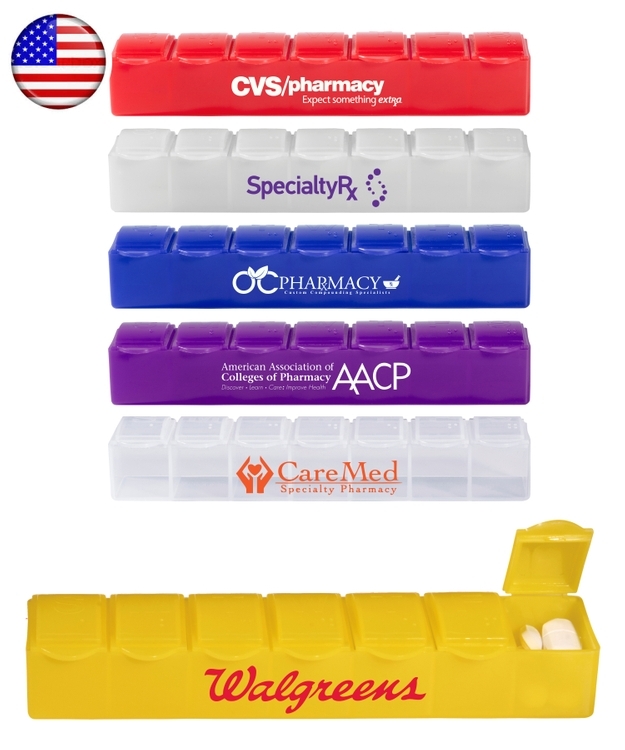 LP Marketing can custom print your personalized advertising message on hundreds of styles of pill boxes, holders, splitters and trays. 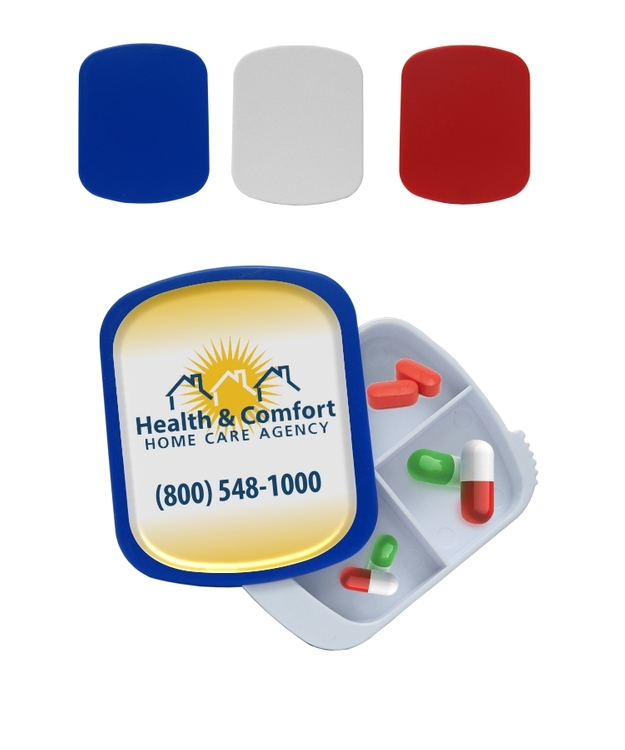 We can help locate the right item for your next marketing campaign! 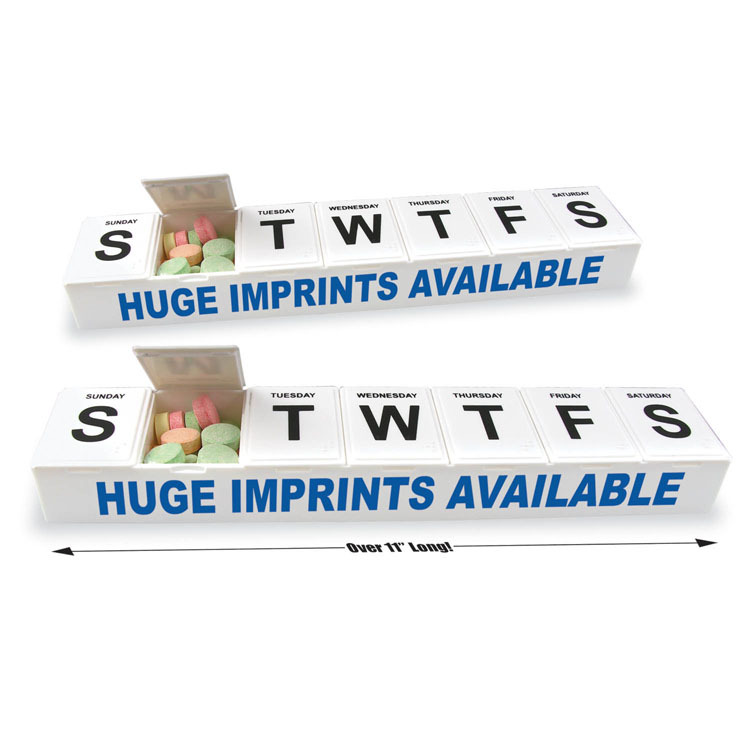 The box have many layouts for storing your pills. 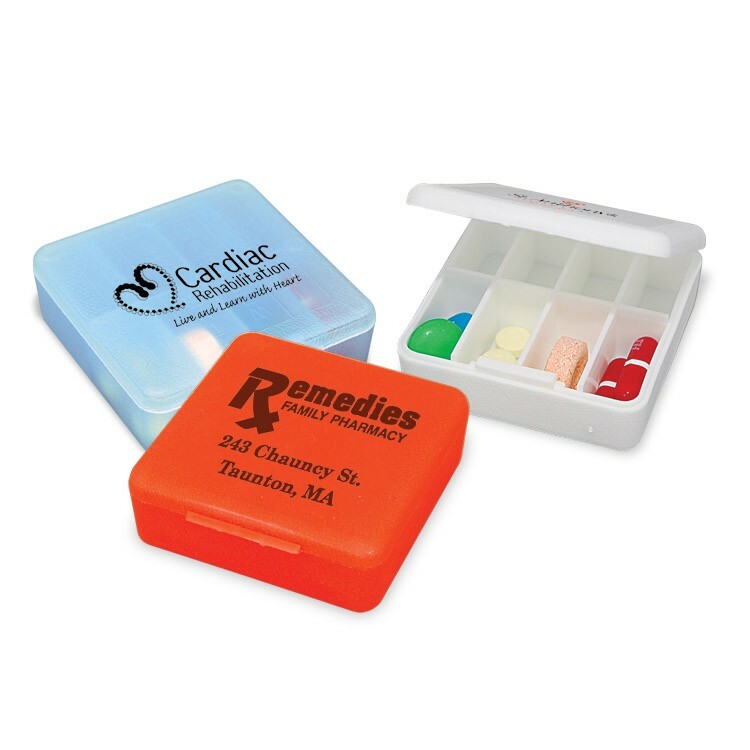 It is perfect for promoting pharmacies, clinics, hospitals and other health practices. Your company brand or slogan can be imprinted. 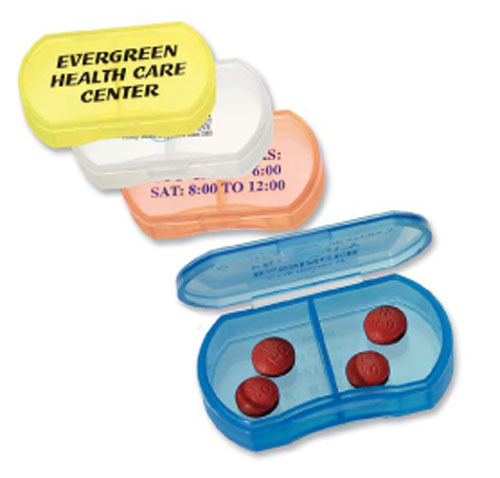 Union Printed, Sliding Pill Case Features 4 Compartments for Morning, Afternoon, Evening & Bed Time, for Proper Sorting Medicine or Vitamins, durable ABS plastic, for long time daily using, Sliding lid makes it easy to open and close. 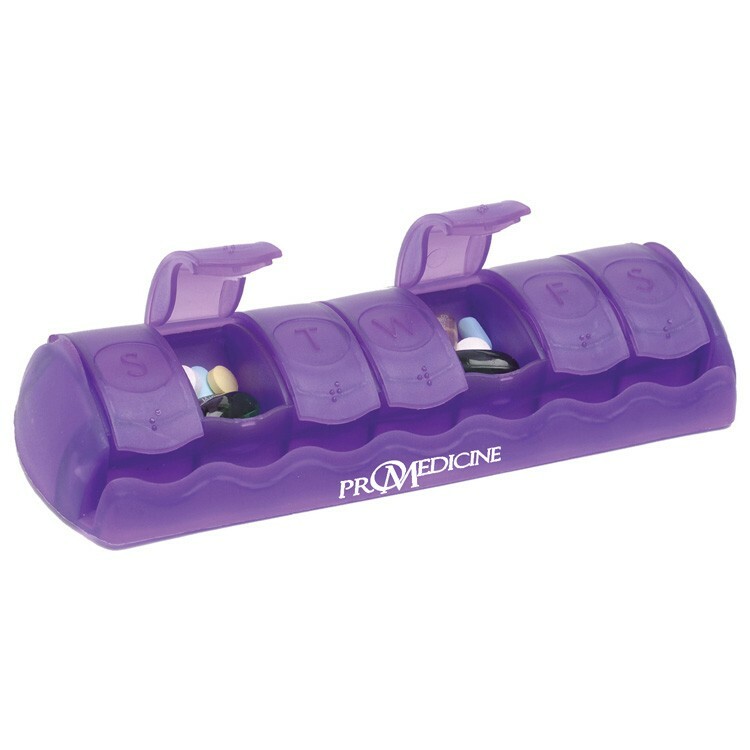 This pill organizer fits anywhere, pocket, purse, Etc. a Slim Design for travel. Full Color Process Epoxy Dome Label Print Included - NO MINIMUM - Decorated in our Union Shop - Union Bug Available at No Charge! 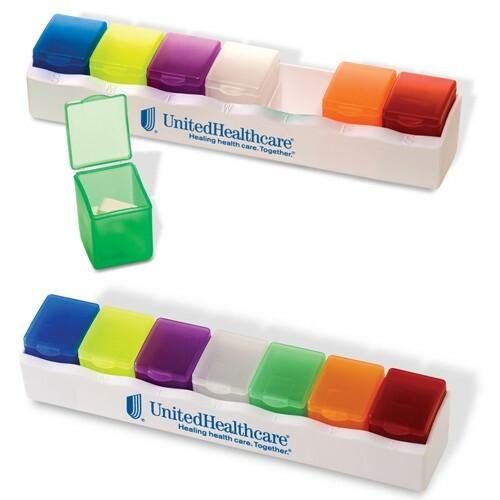 Union Printed, Sliding Pill Case Features 4 Compartments for Morning, Afternoon, Evening & Bed Time, for Proper Sorting Medicine or Vitamins, durable ABS plastic, for long time daily using, Sliding lid makes it easy to open and close. 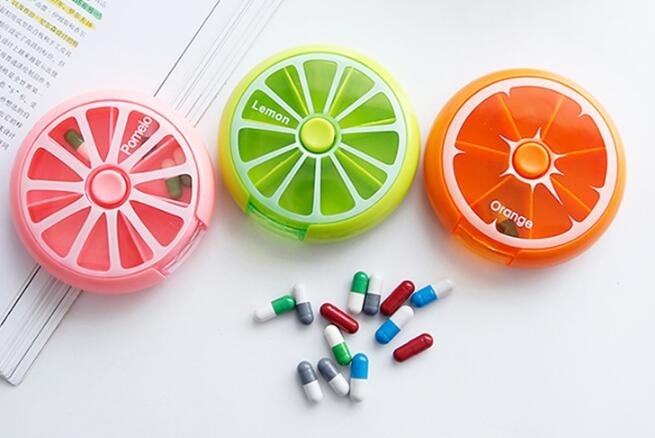 This pill organizer fits anywhere, pocket, purse, Etc. a Slim Design for travel. Decorated in our Union Shop - Union Bug Available at No Charge! 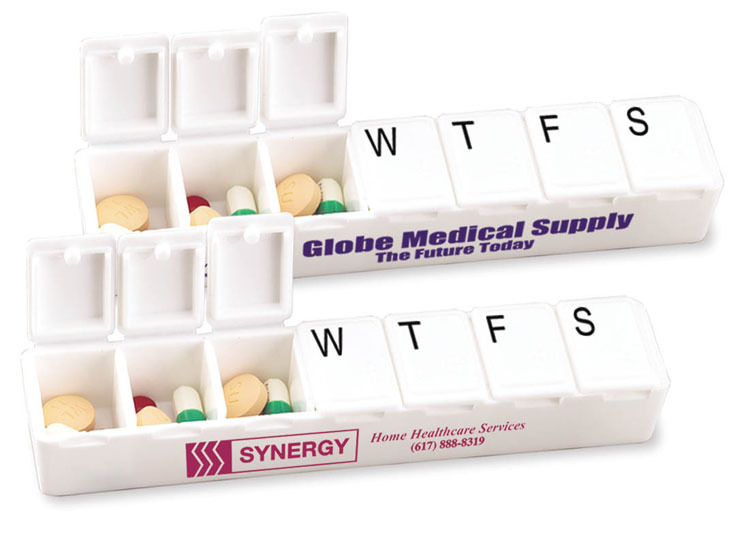 Make your health your number one priority with this handy, useful seven day pill box. 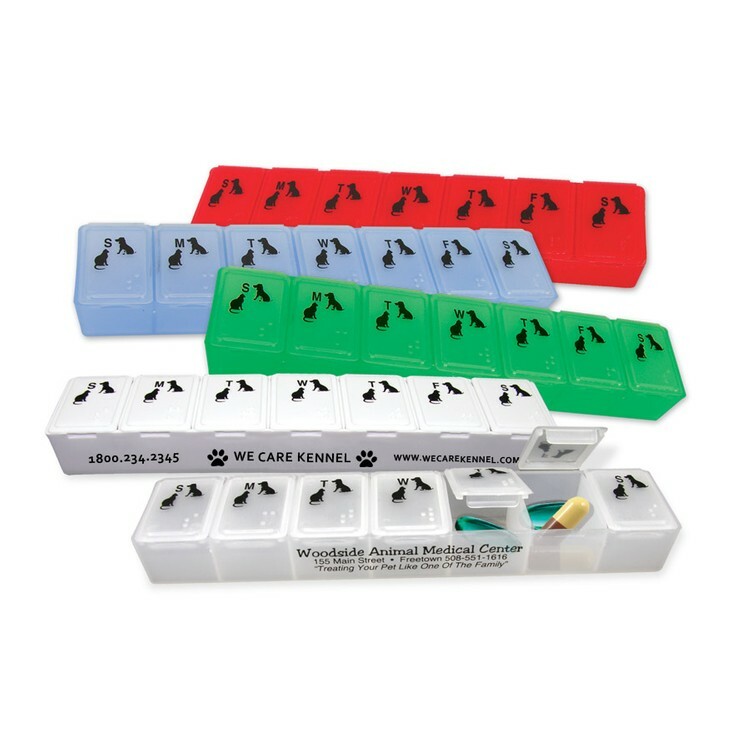 This great item includes seven translucent compartments with the days of the week printed clearly on them. 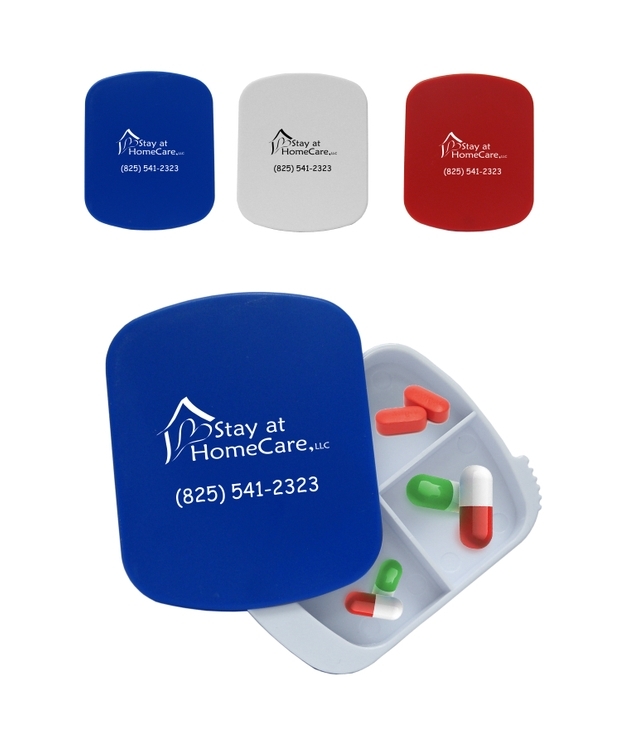 A great promotional product for doctor offices and hospitals, this item can be printed with your logo and is sure to promote a healthy lifestyle. The larger size accommodates those with special needs. 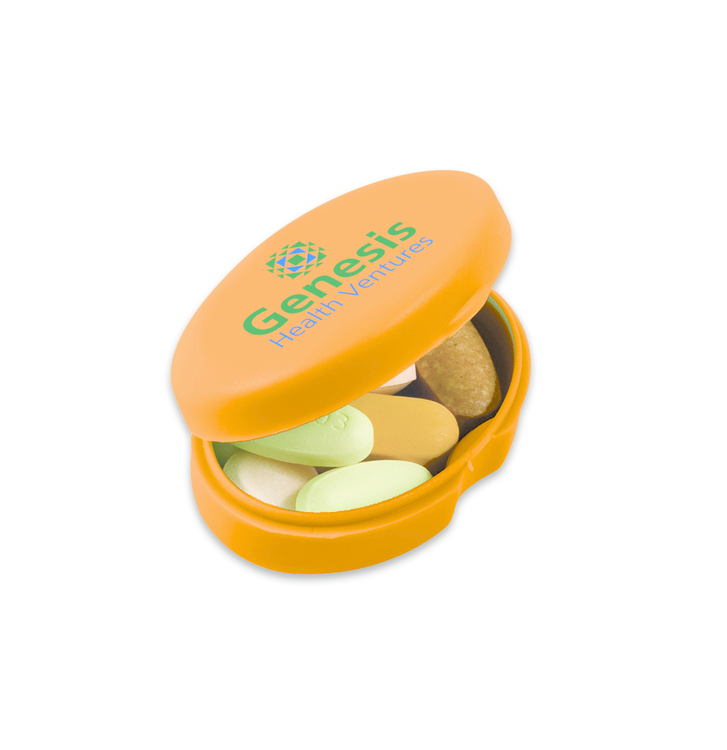 This is our #1 pill box and comes in translucent natural. 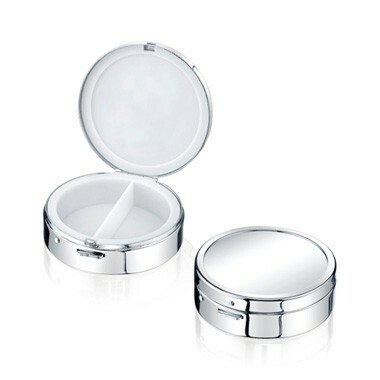 Description: Silver Plated Metal Round Pill Box with 2 compartments Material: METAL Color Available: Silver Measurement: 2 1/8" diameter x 5/8"D Package: Gift Box Imprint Area: 3/4" x 3/4"
PP plastic pill case with removable individual compartments. 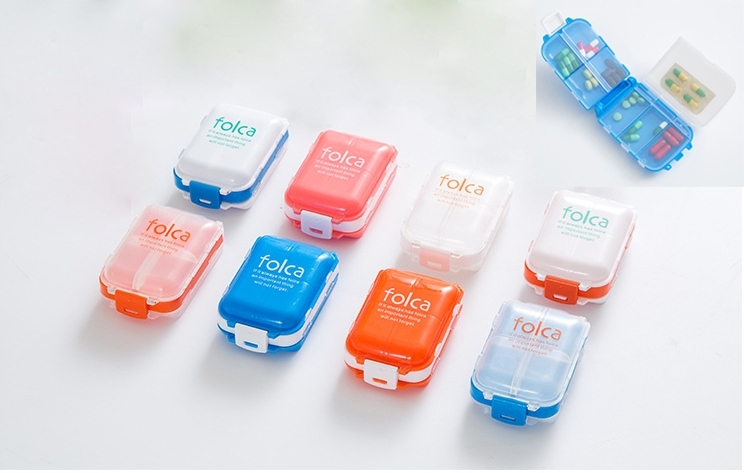 7 compartments, one for each day of the week. Case molded with days of the week. 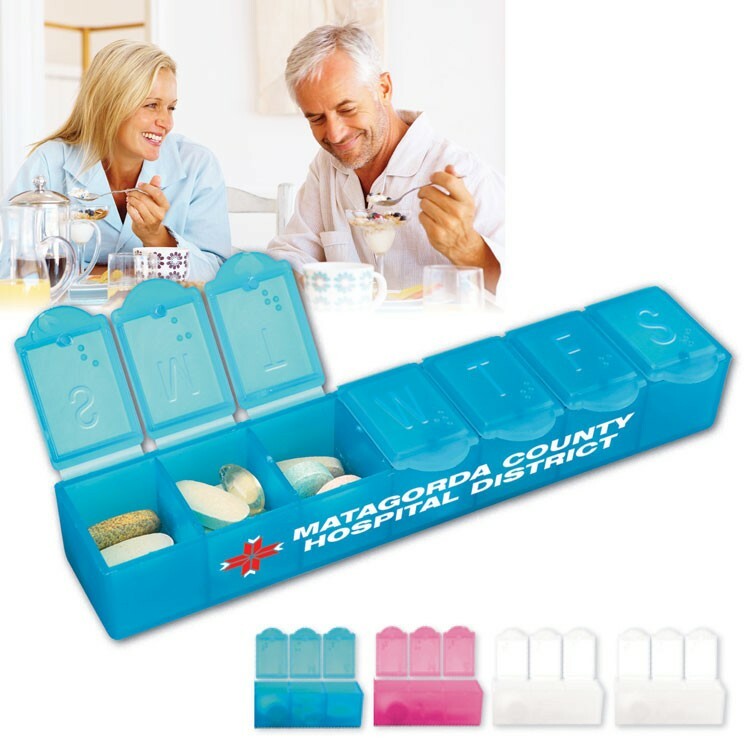 Union Printed, 7 Day Pill Case , 7 Compartments with S-M-T-W-T-F-S and Brail Markings for Proper Sorting Medicine or Vitamins, Made of Durable Polypropylene plastic, for long time daily using, easy-to-open and tight fitting lid. 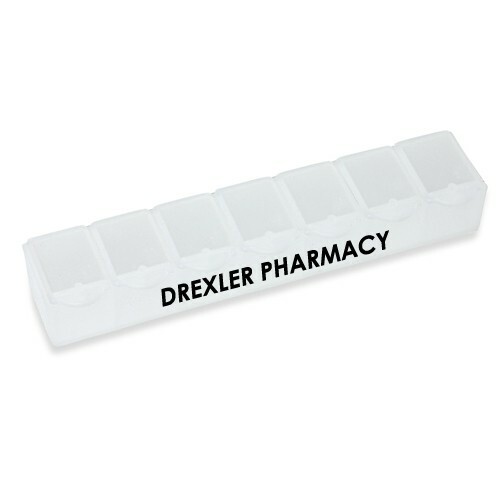 This pill organizer fits anywhere, pocket, handbag, Etc. a Slim Design for travel. Decorated in our Union Shop - Union Bug Available at No Charge! 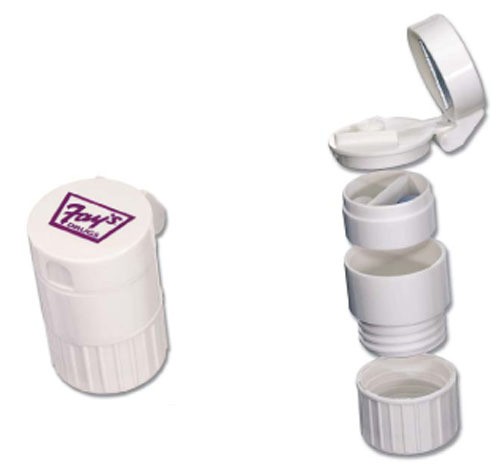 This round pill box with 7 compartments is made of plastic. 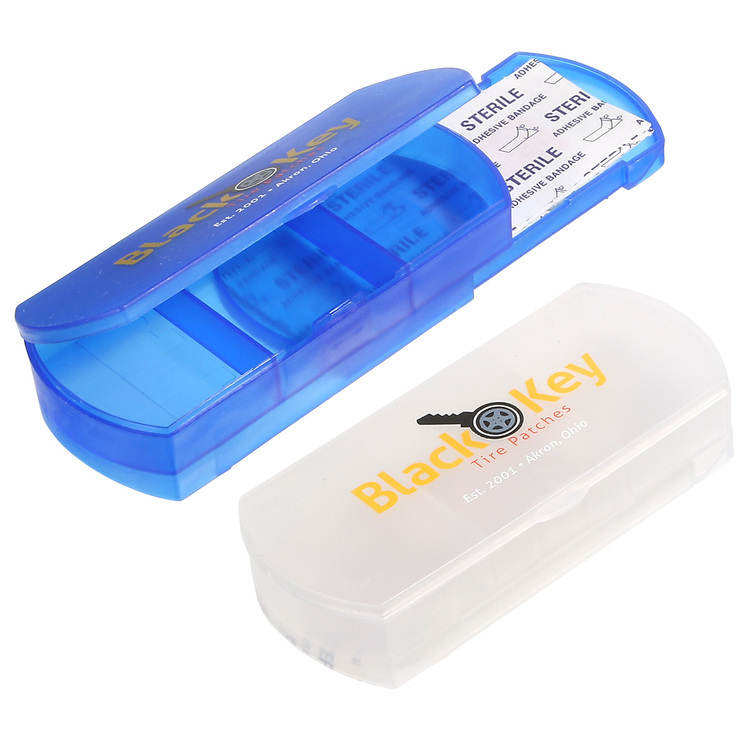 The box will rotating 1 compartment when pressing the button on the top of the box. Color and logo can be customized. 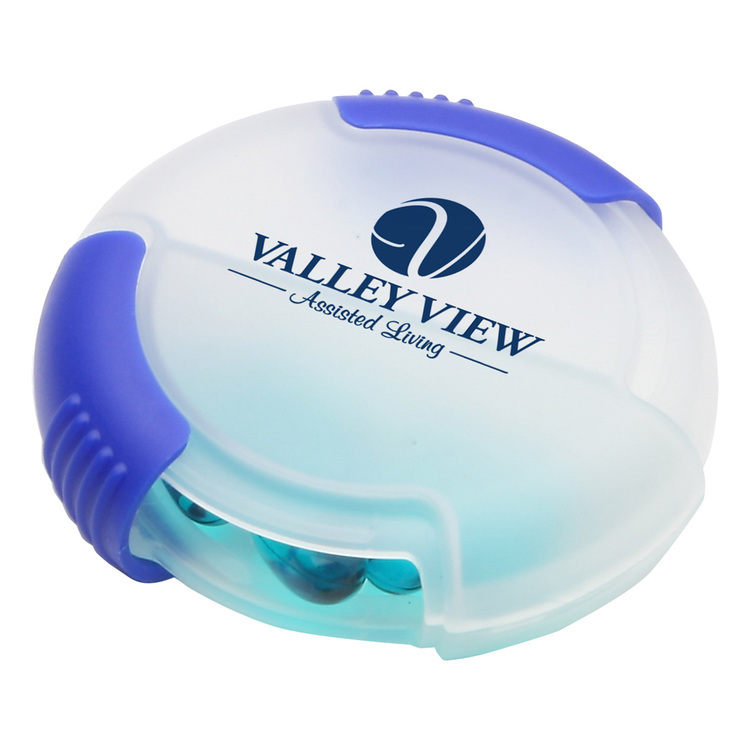 Custom printed pill box holders and splitters are great logo imprinted promotional gifts for pharmacies, health fairs and wellness events. 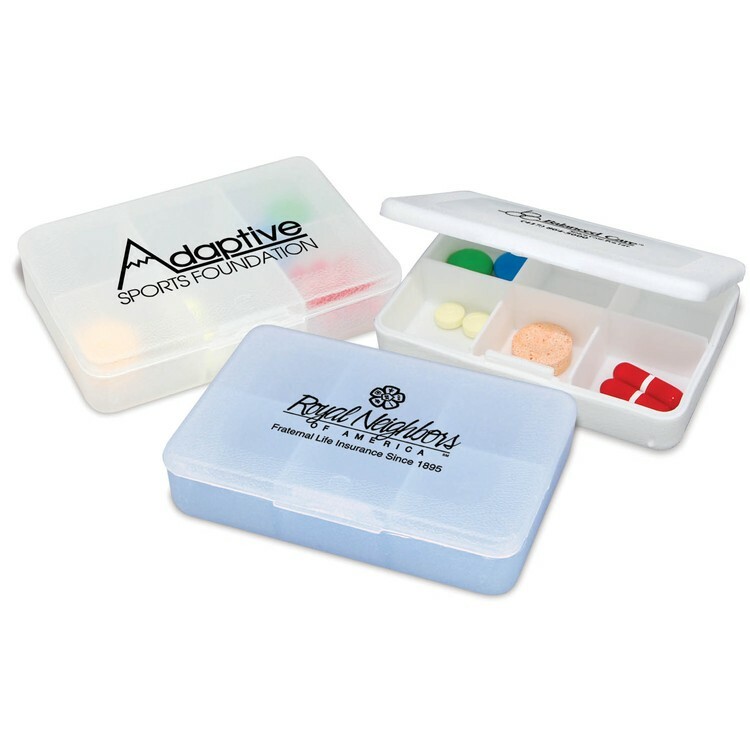 Pill trays and holders can be imprinted with your personalized business or organization logo, motto, slogan, insignia or promotional advertising statement.